General information: Not a physically deep pub with only room for small tables along the bar. Clock themed. This pub has had a curious refurbishment, replacing one type of Victorian (carpet, one or two booths, bit of brass,) with another (boards, ox-blood leather window seats.) It could have been worse, and though it's according taste, I do not understand why all the trouble and expense to replace a charming, cozy, comfortable an unusual interior with this duller, though adequate one. Some of the cost has gone on the drinks too - I paid £4.65 for a pint of bitter. 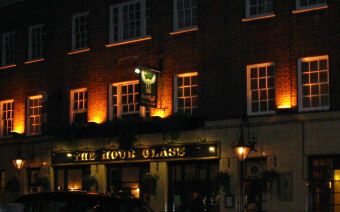 In the Hour Glass's defence it was absolutely excellent. I was quite impressed by the Hour Glass. It has recently re-opened after a refurbishment. In an area not too far from the Michelin Building with a few designer shops around, it was more down-at-heel than I was expecting. But even still, many of the patrons were supping on wine, rather than the ales. The selection was Fullers London Pride, Portobello Market Porter & Trumans Swift. A box of cider was on the bar, which contained Gwynt y Ddraig Autumn Magic. Some rather expensive bar snacks are available. For example, pork scratchings at £4.50. Samples of their other wares, such as Scotch Eggs can be seen on the bar. But I quite liked this pub and it's certainly one of the best in the area. A decent pub in an area dominated by non pub types and tourists. Decent beer, decent food and a decent atmosphere. Not the largest of pubs btw which is is probably why we liked it. A nice cosy pub that is warm and friendly which is more than I can ask for. Staff do a good job and the Landlady doesn't put up with any nonsense. Its nice to be in a pub that has no loudmouth drunks giving you aggro. The food is very good with good service even during rush hour. Great selection of Ale's. 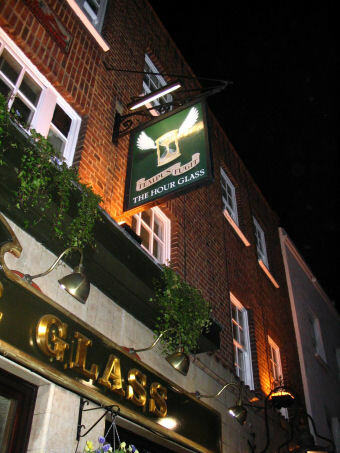 Well done to the landlady of this fine pub for standing up to drunks thinking they own a pub when they buy a few drinks and treat it like the shithole they live in. I am fed up with people ripping soap dispensers off walls, throwing toilet roll in the urinal (what is that all about?!) or sticking their gum everywhere. People are fast to complain if a pub is a bit shabby but then they climb over the furniture and trash the joint. I've had a drink in here a few times and it is well run, the staff are friendly and chatty and you can tell it is managed by a real professional, not some corporate half wit. Keep up the good work and if we all have a word with everyone acting the arse and embaress them into going elsewhere then more power to us.